After the jump, full romaji & then English, translated by Zer0, with notes. I absolutely love this song, and when I love a song, that's when I care about the lyrics. Unfortunately, the translations I found were really shoddy based on the romaji lyrics I saw accompanying them. Granted, translation is as much the work of the translator as the original author - everyone has their own interpretation. So perhaps the other translations I found really aren't all that bad. I'm really glad I went through and tried to interpret the song myself though - this is the translation I got, perhaps if you know Japanese better than I do, you'll understand the meaning of some of the imagery better (and you may very well find tons of huge, stupid errors in my grammar). and destroying the dreams of the butterflies. Under the moon, night after rainy night. 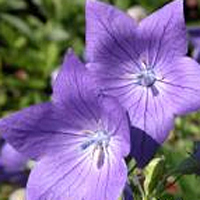 *(1) Hime Murasaki ("Princess Purple") is a specific variety of the Fuji Blue Japanese bellflower (Platycodon grandiflorus). Its name was left untranslated because even in English, the flower goes by its Japanese name. *(2)She pronounces this "inochi" ("life") but she has the kanji for "ai" ("love") written here. *(3)She uses the kanji "unmei" ("fate") here but pronounces it "hoshi" ("stars"). The phrase used is "the rotation of the stars" here but basically that means the path that fate has dictated. *(4)More writing/pronunciation changes. The kanji used here is "jounetsu" (passion), but she says "ai" ("love"), implying that this love is a fleeting thing that can't last. *(5)She uses the kanji "rekishi" ("history") here but pronounces it "toki" ("time"). *(6)The lyrics here really say "they follow only you," the implication being that the feelings don't stick with her. Both the guy and her feelings for him are both going away, basically. He leaves, and she eventually forgets about him.